USAID is partnering with the private sector and local communities to minimize risks associated with agricultural, forestry, energy and other land-based investments. USAID’s experience working across three countries with The Hershey Company/ECOM Agroindustrial Trading, Illovo Sugar Africa Ltd. and the Moringa Partnership demonstrates that respecting and bolstering local land rights can be good for businesses by reducing operational, financial, and reputational risks for companies. They also benefit local communities by increasing tenure security, which in turn provides incentives for local farmers to invest —subsequently improving economic growth and building local resilience. Land-based investments have the potential to bring benefits to local people and communities. However, in places where land rights are undocumented, unclear or unenforced, local people may not be treated as important stakeholders and their claims may be overlooked or ignored. If companies and investors lack the tools to recognize and engage effectively with local stakeholders, it can increase their financial, operational and reputational risks. International investors have long recognized that unclear and insecure land rights systems pose a risk to their businesses—a risk that many believe is outside of their manageable interest. USAID’s partnerships with businesses and investors seek to find solutions to help companies invest responsibly. USAID is partnering with some of the world’s leading companies to test tools and interventions that clarify and strengthen land rights for local women and men in order to boost agricultural productivity and household incomes in local communities, thus enhancing prosperity and resilience. Through its Responsible Land-Based Investment Projects, USAID is helping companies and investors test new ways to work collaboratively with commodity producers, family farmers, customary leaders, farmers’ cooperatives, and financial institutions to respect and protect land rights in and around investment sites. Our projects show that, given tools and support, companies can effectively manage land-based risks to their businesses and supply chains and also support local communities. The projects demonstrate that more secure land rights incentivizes growers and family farmers to make long term investments that increase productivity—reducing supply-related risks for companies. Greater clarity of formal and customary land rights allows companies to gain valuable information about the size and extent of legitimate community landholdings— reducing risks related to encroachment and infrastructure development. This information can also enhance community engagement efforts— reducing operational and reputational risks. Engaging with landholders on a more equitable basis helps companies meet environmental, social and governance commitments that asset managers, consumers and employees increasingly demand. The innovative projects between USAID and Hershey/ECOM, Moringa and Illovo demonstrate that private companies and investors can play an important role in helping individual farmers and communities clarify and strengthen their land rights, reducing risks for both local farmers and investors. In Ghana, USAID is partnering with Hershey and their cocoa supplier, ECOM, to clarify agreements between farmers and customary landowners that historically discouraged cocoa farmers from replanting old and diseased trees. Farmers often do not rehabilitate their cocoa crops out of fear that if they replant, they will lose ownership and control over the land. Operational data from cocoa-producing areas within the Hershey supply chain indicates that 96 percent of farms are well past their most productive years. This has led to a sharp decline in their yields and represents a major risk in their supply chain. It also negatively impacts farmers’ abilities to earn a living. Only two percent of Ghana’s farmers have formally documented rights to their land and as populations increase, these farmers have found their access to land under threat. This has impacted their ability and willingness to invest labor and capital into keeping farms productive. 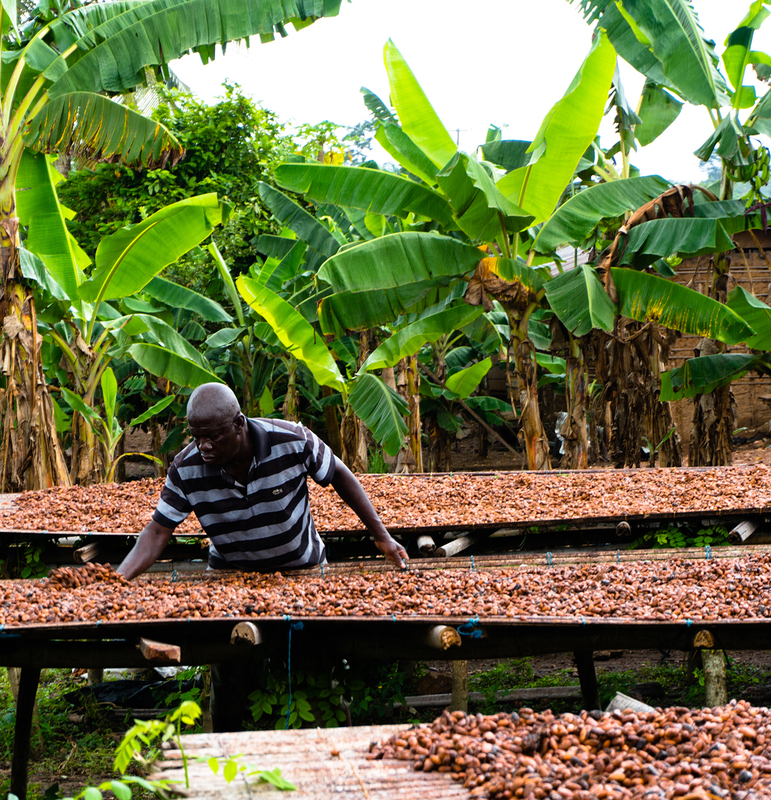 In order to mitigate this supply chain risk, the project focused on the tangible challenges that cocoa farmers face, working to strengthen local land rights and help finance the costly rehabilitation of farms. Trained chiefs to mediate land disputes and advocate for farmers. These activities were designed to increase cocoa yields by helping the cocoa farmers overcome the challenges that have prevented them from rehabilitating cocoa farms and to use secure documented land rights as a catalyst for secure investment, improved livelihoods and improved natural resources management. In Mozambique, USAID partnered with Illovo, Coca-Cola’s largest sugarcane supplier in Sub-Saharan Africa, to develop and test new approaches to improve local tenure security in areas surrounding their sugar estate and mitigate operational, financial and reputational risks. The project centered on Illovo’s Maragra Sugar Estate in Mozambique. In addition to growing sugarcane itself, the Estate procures sugarcane from hundreds of growers working on approximately 5,000 ha of surrounding land. To guide its procurement, Illovo launched its Group Guidelines on Land and Land Rights in 2015. The Guidelines commit the company to respect the legitimate land rights of its local stakeholders and only contract with cane growers who can demonstrate documentation of their land rights. However, in the past, conflicts over land often arose among farmers due to a lack of land documentation. The lack of documentation contributed to uncertainty in Illovo’s global sugarcane supply chain and also limited their ability to effectively engage with local growers. Developed a new grievance mechanism for Illovo to address land-related and other concerns among local community members and growers. Leveraging this innovative partnership, the project will ensure that local land rights are secure enough for Illovo to responsibly do business with the community, for individuals to invest in their own land and for the government to record and recognize boundaries. In Kenya, USAID partnered with the Moringa Partnership to strengthen their environmental and land-related due-diligence processes to ensure the sustainability of its investment in Asante Capital, a Kenyan timber, moringa and ginger oil producer. In 2017, the Moringa Partnership invested in Asante Capital as part of its nearly $100 million fund for sustainable agroforestry. Part of Asante’s supply chain consists of farmers who grow moringa trees and ginger on their own parcels of land. Asante is working with 22 growers to supply seedlings, extension services and, in some cases, credit for irrigation equipment to local farmers. These farmers, who hold small plots, need consistent and secure land rights to make investments that would allow them to cultivate moringa and ginger and generate a return on these infrastructure improvements. This is particularly important in the case of ginger, a water-dependent crop, that must use irrigation technologies that can be costly to install. Farmers are only likely to make these investments when their land claims are secure. Incorporated an environmental impact assessment of the investment with particular emphasis on water use, access, and sustainability. These activities were designed to help Moringa and Asante identify and mitigate any existing or prospective land-related risks. For Hershey and ECOM, the project provided a pathway to directly engage with communities and customary officials at the local level to secure land rights, an important but often sensitive topic. ECOM is able to encourage farm rehabilitation that will secure higher yields of cocoa over time, develop a stronger supply chain for Hershey, and encourage sustainable natural resources management. For Illovo, the partnership with USAID helped the company provide documentation to its growers, accurately estimate cane supply from growers, and operationalize the Illovo Group Guidelines on Land. Develop a new grievance mechanism to address land-related and other concerns among local community members and growers—which can be adapted for use across its six facilities in sub-Saharan Africa. The project in Kenya, focused on a thorough due diligence process, provided Moringa with critical information about land and environmental issues that have the potential to impact the supply of timber, ginger and moringa to its investee, Asante. Highlight the importance of developing a formal grievance mechanism to address conflicts with growers and other local stakeholders including neighboring land holders. USAID and our partners are using innovative solutions to minimize risks for investors by respecting local land rights and building communities’ self-reliance. These three projects illustrate that the private sector can successfully address risks related to land tenure, including in its supply chains. Best practice guidance and implementing tools can help corporate actors navigate riskier investment climates and strengthen land rights. Even in the absence of national government partnerships, investors and corporations can partner with communities as a first step toward creating sustainable and mutually beneficial long-term investments. As illustrated by the partnership with Hershey/ECOM, community-based natural resource management systems can reduce pressures on farmers to encroach on nearby forested land. This project improved communities’ awareness of the importance of shade trees and forest coverage, which will help make their cocoa crops more sustainable and could help to bring about forest regrowth. Partnerships with communities can also help companies in the private sector meet their human rights commitments, strengthen their supply chains and avoid the potential operational, financial or reputational costs of land disputes or other land-related issues. Finally, these projects demonstrate the value of enhanced due diligence by the private sector as related to land and environmental risks. For example, the partnership in Kenya shows how taking steps early in an investment process can help avoid or mitigate problems that could contribute to conflict, negatively impact supply chains and operations, and limit the potential for longer-term growth for firms and communities.